My name is Franklin. I am a first generation Cambodian American, I recently graduated from UC Berkeley with a degree in computer science, and I want to save lives using computer vision. By representing visual data (like images and videos) as numerical pixels, we can develop algorithms that automatically analyze these pixels and output something we term “meaningful”. Such algorithms can be supervised (where we label data, so the algorithm knows the correct answer during training) or unsupervised (where no label is necessary, and the algorithm clusters images on its own). The power of computer vision can be seen if you generalize those examples to not just cats, dogs, and ducks; but to many other objects: cancer cells, people trapped in natural disaster situations, structural issues in a building, patients in a hospital room, … the list goes on. As you can now imagine, there is a full list of ways that computer vision can be used to save lives, and this can range from agricultural issues to counter terrorism. *For those more technically inclined, a paper submission is on the way for both of these projects, so I will save the technical aspects of these projects for a later medium post! Ultimately, these are the types of projects I am passionate about — applying computer vision on medical data so I can help doctors do what they do best: save lives. So, I have officially said good bye to an offer from a “big” tech company and quit recruiting all together. If I am rejecting offers and not recruiting, then that leaves me only one option: sleeping on the streets. Just kidding, it means I am going head first and doing anything I can to build a startup (and maybe in the process sleep on the streets, lol). I will do something special and impactful in America, then come back to Cambodia and not only help financially, but also share wisdom and knowledge to the people. Therefore, my first step to fulfilling this promise is to build a successful computer vision startup and have our products be used in hospitals all over America — and eventually the world. More importantly, we Cambodians have not been able to show the world our true potential because we lost a lot after the Cambodian Genocide, and my goal is to be the first of many that send a message to the world that we are still out here to achieve greatness. Image of a necklace and a ring that my Uncle in Cambodia gifted me. Everyday it reminds me of my promise and symbolizes a marriage to that promise. 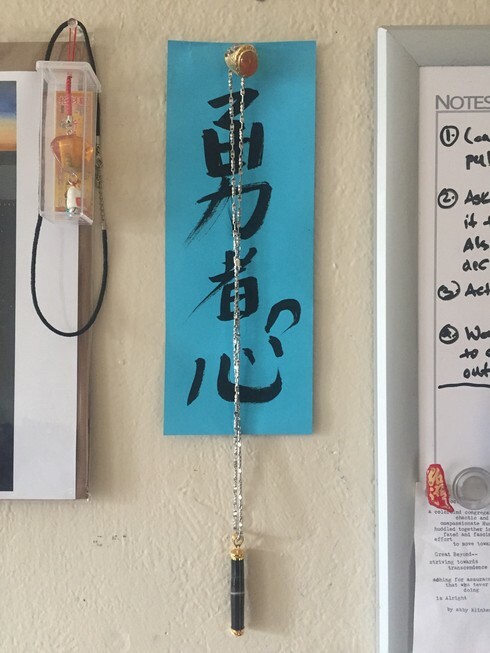 I hang both over a paper that writes “Heart of a Warrior” in Japanese calligraphy. This summer (summer of 2019), I will be dedicating even more time at UCSF and on building products that will hopefully be used in practice at hospitals. For now, welcome to my journey and mission to save lives. I hope that you too join me and dedicate your craft for the better of the good. Much more of my story to be told and much more to be written.